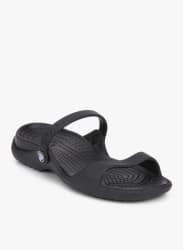 Let the crazy you pop out for a day when you get this pair of sandals from the house of Crocs. Let the sun go down for uncomfortable sandals, opt for this pair of sandals that is crafted using comfortable croslite sole. Tie your hair in a high bun, throw on cowl pants and a body-hugging top with this pair of sandals for the look of the day.